This is a fairly straightforward cookie recipe. It contains nine ingredients, and three of those are made from goat’s milk: goat cheese, goat milk powder, and cajeta, which is a thick caramel sauce made from sweetened evaporated goat’s milk. If goat milk products are not available in your area, you can also make these cookies using cow’s milk products. If you must substitute, choose a full fat cow’s milk powder, dulce de leche for the cajeta, and a strong and distinctive cheese such as gorgonzola to take the place of the goat cheese, which would also go well with the honey in the recipe. Oh, and by the way, if you are thinking of using butter made from goat’s milk, I did it for you already. I made a separate batch of cookies, and while they looked the same, they were not as good. I think it was because the goat’s milk butter I used was salted, and so the cookie as a whole was a tad salty, which made the honey in the cookie a little hard to detect. Overall, it wasn’t a bad cookie. So maybe if you do decide to use goat’s milk butter and it’s salted, make sure you don’t add any salt in your cajeta or flour mixture. And that’s it! Enjoy your Feb. See ya next month! If using homemade cajeta (which I strongly suggest that you do), make the cajeta and let cool to room temperature. Sift together the dry (first four) ingredients into a bowl and stir with a whisk several times. Set aside. Cream together the next four ingredients with a hand held electric mixer with beater attachments, until smooth and creamy. Add the first mixture to the second mixture and beat on low only until all flour is moistened and a cohesive dough starts to form. Roll out dough on a nonstick surface (I used a plastic cutting board) or use two pieces of plastic wrap to about an 8-inch square with a 3/4 inch thickness. This doesn’t have to be exact, just an estimate. Crumble about half the goat cheese over the surface of the dough and roll or fold the dough and add the rest of the cheese and fold again. There’s no need to knead. 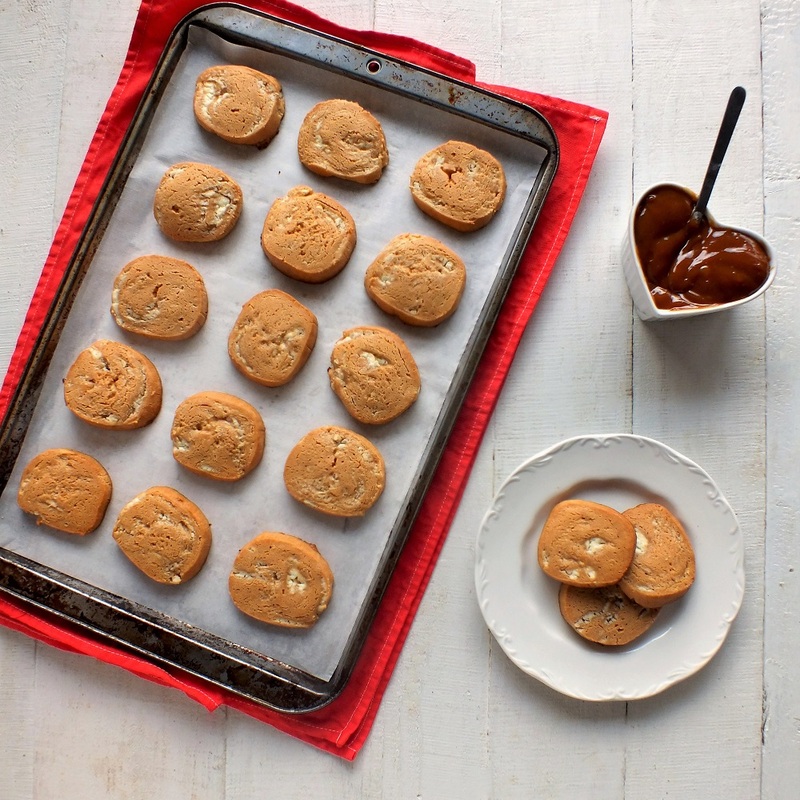 In fact, what you want are visible pieces and swirls of white goat cheese against the tan cookie dough. Using two large pieces of plastic wrap, roll the dough into a foot long log. Wrap with plastic and refrigerate at least an hour to overnight. Starting from one end of the log, cut out a disc of cookie dough to the desired thickness. Mine were about 1/2-inch thick and I made a little more than 2 dozen cookies. Thickness will affect number of cookies and baking time, obviously. Arrange on parchment lined baking sheets with about 1 inch apart from each other. They don’t spread much. Bake for 18-20 minutes or until bottoms are lightly golden brown and remove from oven. They may still be soft, but are totally done if the bottom is fairly browned. Lift one up carefully to check. Let them sit on the baking sheet a few minutes to harden somewhat before transferring to a wire rack to cool completely. Store in an airtight container and consume within a few days, ideally. Place all ingredients in a large pot and stir almost constantly, especially after the 40 minute mark, with a heat safe rubber spatula, scraping the bottom often to prevent scorching, on medium heat for about 45 minutes to an hour. Mixture might bubble up in volume initially and not change color until later in this process, so don’t be alarmed. Can be stored in a covered container and refrigerated for about a month. 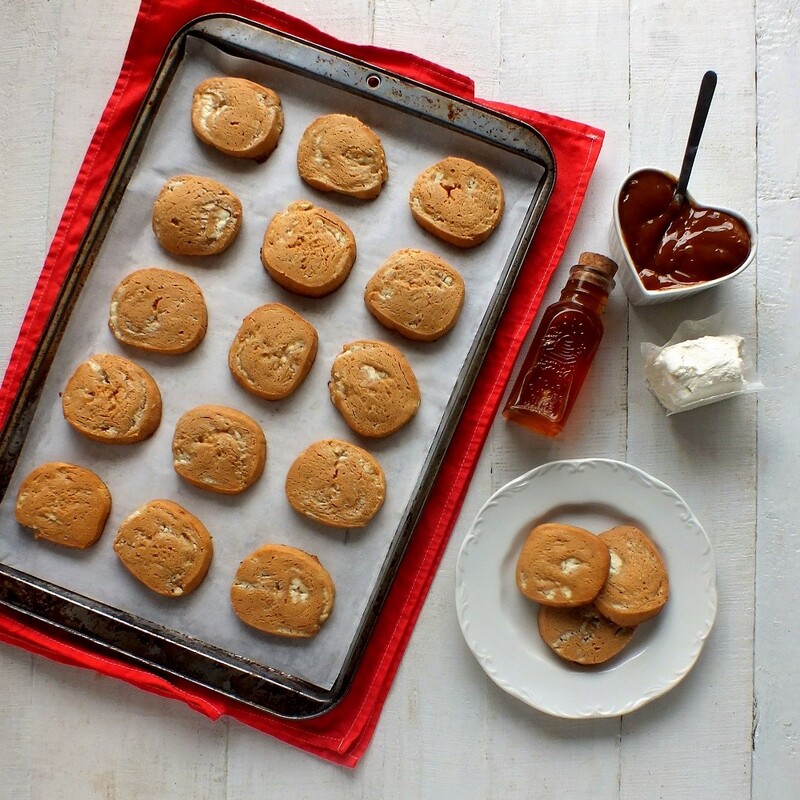 This entry was posted in baked goods, baking, cookies, food blogging, snack, Uncategorized and tagged cajeta, caramel, goat cheese, goat milk powder, goat's milk, honey goat cheese cajeta cookies. Bookmark the permalink. Dave, you have made me think ‘cookie’ in a whole new way. Thanks. It’s a good day. Thanks. 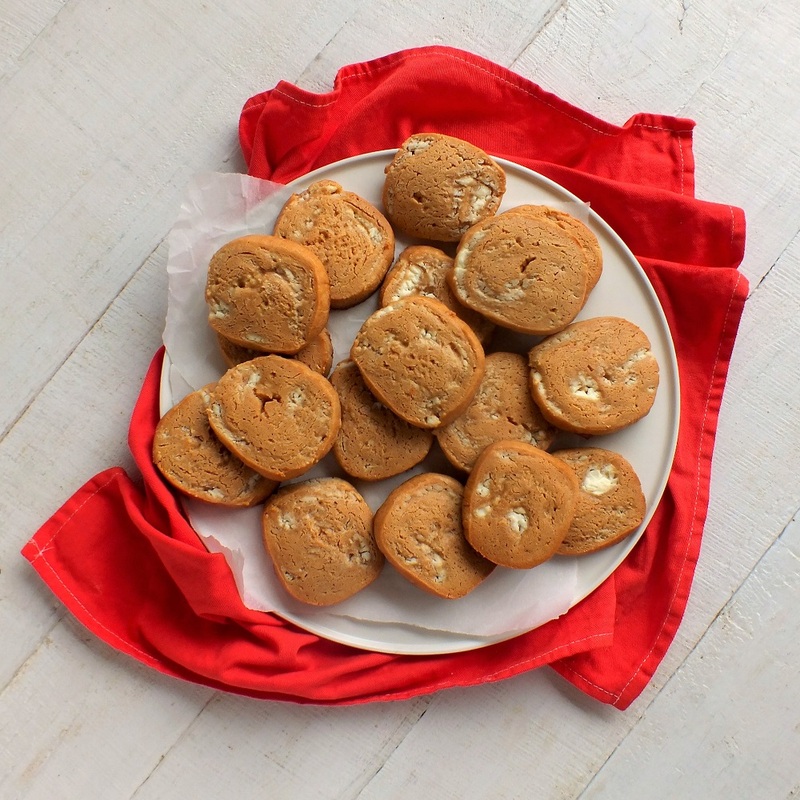 Such an interesting cookies recipe, love the savory aspect of it! 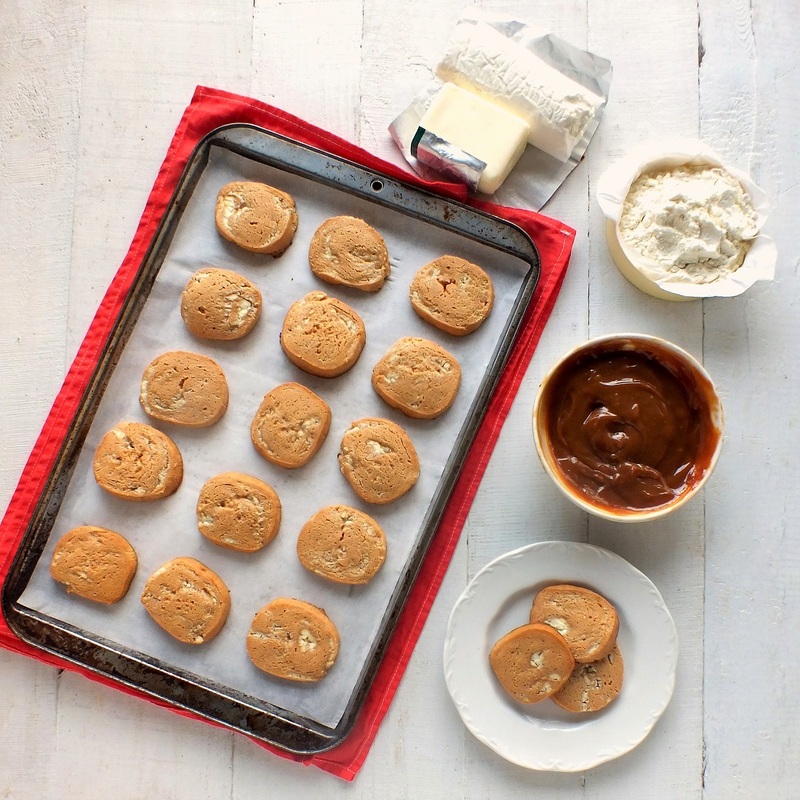 Cookies with goat cheese? what an innovative combination. I have to give these ones a try. Thanks for sharing and have a great week! A goat herder!? Maybe in another life? Ha! I do enjoy watching baby goat videos! Oh the goat cheese addition sounds wonderful!